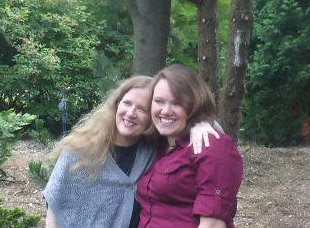 The Compulsive Reader: Suzanne Collins Event! Hope you had a great Monday! Mine was fabulous! 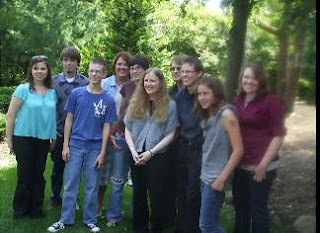 I traveled to Chelsea, MI to participate in the Borders Book Club discussion with Suzanne Collins. Borders has a series of really neat videos in a very relaxed, very laid back tone with a whole slew of authors, including Sarah Dessen, Christopher Paolini, and Stephenie Meyer. You can check out all of their videos here, which I really recommend that you do! They're all very awesome, and just brimming with great information! I went down to Chelsea, which is about three hours away from where I live, last night because we had to be there by 8 AM. There were a bunch of really cool people there, and in between getting our make-up done, we had some really great conversations about books, authors, ALA, and libraries. It was tons of fun! 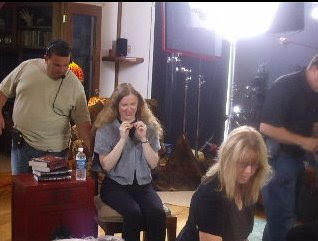 Here's one of us getting set up and seated. 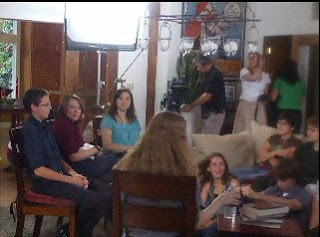 Suzanne is the one with her back to the camera! ....which involved a lot of complicated fastening and adjusting. Meanwhile, Suzanne was showing off her awesome, awesome necklace which was a real gold version of Katniss's mockingjay pin! 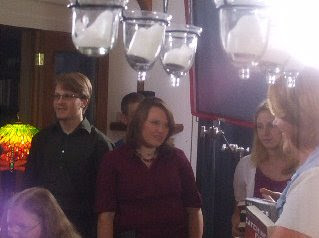 It's hard to see here, but hopefully we'll get a good look in the actual video. All of us (even the guys!) wanted one as well, but unfortunately it was a special order...but I think whoever made it could sure make a pretty penny by making more for fans! 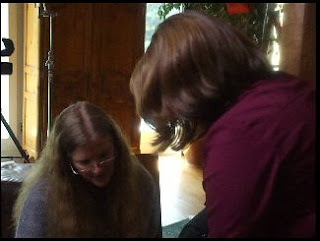 Afterward, Suzanne signed books and us readers continued our conversation that the camera cut off. 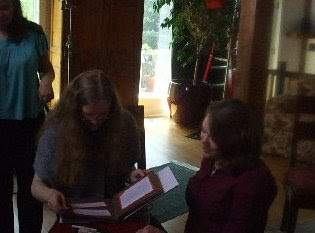 And here I am getting my book signed! And here is when I presented Suzanne with our project! She loved it so much, and asked me to say THANK YOU to everyone who contributed. I know I said I would vlog it, but I actually ended up finishing it at 11 last night, so I did not get the chance. Sorry! Nonetheless, it turned out really well, and she loved it! 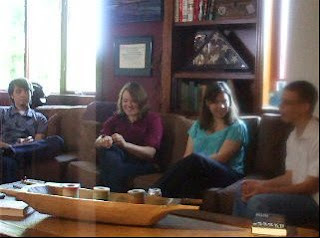 And here is a picture of our group! It was so much fun. We got to talking and just could not stop. I think we were all pretty bummed when the camera crew told us we had to wrap up! And here is a picture of me and Suzanne! 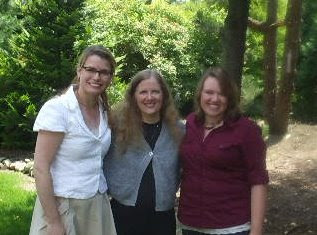 And I met a lot of really great people today, including Suzanne's publicist at Scholastic, Sheila Marie (on the left). It was so much fun to finally put a face to the names! She is doing the screenplay for the official The Hunger Games movie, which will be done by Lionsgate, at least for the first few drafts. She has not started it yet, but plans to do so after she's written the third book (and I think we all agree that we want her to write the third book first!). There's not too much info out right now about the movie. Suzanne did say that they would try to keep it PG-13, which might be a little bit of a challenge, and when asked, she said that the tentative release date will be sometime in 2011. That's all I can think of! The rest you will have to wait for until the official video airs! I will most certainly let you know when, but I'll tell you now that it will be somewhere around September 1st. Based on our discussion (and not knowing what Borders may or may not edit out), I'd say that unless you want some mild spoilers, you may want to read Catching Fire first. It was a great day! A huge thanks to Suzanne for doing this and for the amazing people at Borders for putting this together! I had the most fun today than I have had in ages! Oh wow, that is awesome! I can't wait to see the video! That's so exciting that Sheila Marie went too! That sounds like a really great time. Thanks for sharing! Fantastic! It's definitely nice putting faces to names, like Sheila Marie's. :) I can't believe you got to meet Suzanne for such a cool-sounding event! what a great time! i almost did the one for SM. I was actually chosen but wasn't able to take off of work! i'd love to try to do another one! it looks like an awesome experience! Wow, lucky lucky you! Looks like a great event :-) And cool to see Sheila Marie. She's my publicist at Scholastic too and Jim and I love her! So curious what the movie will be like! Sounds like you had a great time. And, yes, I'm jealous. Can't wait to read book 2. Very much looking forward to the video! And I'm so thrilled for you that you had such an awesome experience. SO COOL! awesome news about the movie too. thanks for sharing. I definitely love this series. I'm so happy you had the chance to go and participate. What a wonderful event to be involved in. How did you get involved? I'll be interested to see who gets cast in the movie and yea, keeping it PG13 might be challenging unless the focus more on the build up to the games than the games themselves. I am so beyond jealous. What an awesome day that must've been! 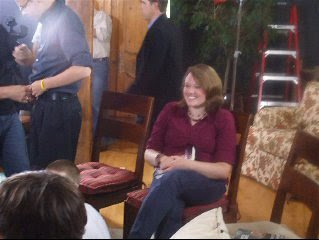 I just saw the interview on YouTube and I'm so jealous thta you got to talk to Suzanne Collins about the book! I just finished reading it and I'm obsessed! !